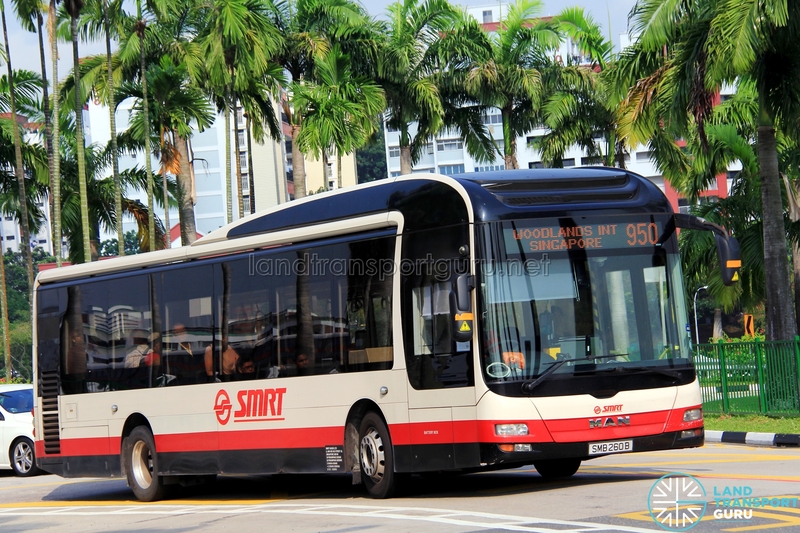 SMRT Bus Service 950 is a cross-border service plying between Woodlands Temporary Interchange and looping at JB Sentral Terminal in Johor Bahru, passing through Marsiling, Woodlands Centre, Woodlands Checkpoint and Sultan Iskandar CIQ. 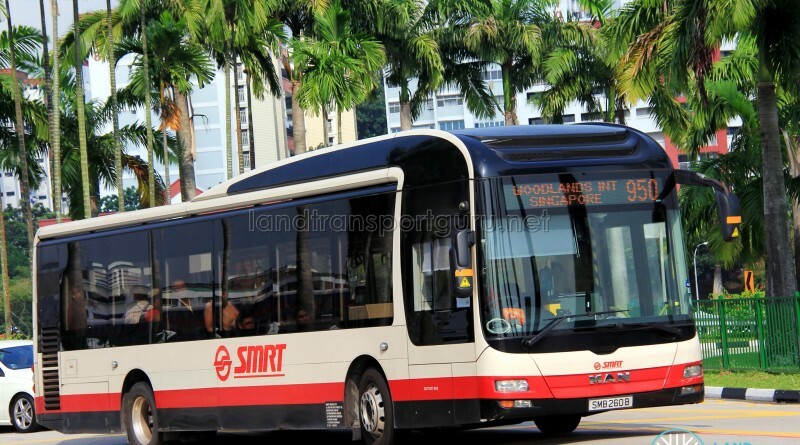 It is currently the only cross-border service operated by SMRT Buses. Service 950 is a cross-border route connecting Woodlands Regional Centre, Marsiling MRT and Woodlands Town Centre with the border town of Johor Bahru in Malaysia. The route experiences high demand throughout the day and is SMRT’s only cross-border service. Due to varying traffic conditions at the Causeway, travel times and frequencies may increase significantly when traffic congestion occur. Despite being a wheelchair-accessible service, wheelchairs are not allowed beyond Woodlands Checkpoint. Hence, wheelchair-bound passengers are currently unable to use this service to cross the border. At each checkpoint, passengers have to alight and clear customs before boarding the bus again. When crossing the causeway between Woodlands Checkpoint and Johor Bahru Checkpoint in either direction, commuters may re-board Bus Service 950 to resume their ride. Tapping out from the bus at a checkpoint will suspend a journey and allow the resumption of a journey afterwards. Cash paying passengers should retain their ticket as proof or payment, and produce it when re-boarding buses at checkpoints. Fare: Only Singapore currency is accepted. Charges basic distance fares. See Bus Fares. Only SPAD-registered single-deck buses are allowed on cross border routes. Currently, only some MAN NL323Fs are SPAD-registered. In accordance with Malaysian regulations, buses must carry relevant documents, fitted with a third brake light at the rear, and attached with Malaysian stickers dictating legal speed limit. Previously, some Mercedes-Benz O405s and OC500LEs were SPAD-registered as well. You try to complain to LTA about this one.. Svc 950 cant do anything at each checkpoint if both checkpoint is congested every weekends.. Weekdays no problem. I try before liao. Use your common sense. What you expect faster service? Don’t forget there is 170A which end only at Woodlands Train Checkpoint then continue back to Queen Street. 160 ply from Jurong East to loop JB Sentral , 170 from Queen Street to Larkin Terminal then 170X from Kranji MRT to JB Sentral..
Take note 950 use only 15 registered bus with SPAD. 170 and 170X use only 45 registered bus with SPAD whereas 160 use only 15 to 20 registered bus with SPAD. Take note SPAD is from malaysia which allow bus to take passenger to JB leh.. What you want from LTA? LTA cannot do anything with SPAD. Only SMRT and SBS need to get bus to registered with SPAD.. All bus registered with SPAD is old bus model like first batch bus only.. You notice why new bus model is not allowed into malaysia even 170A use new bus model.